We did the first Market Analysis last September, and hope to continue to do this every 6 months and continue to make it better (so feel free to send suggestions or corrections to bob.bickel at runsignup.com). We do this as part of our own internal market evaluation processes, but share it since there does not seem to be a good source of information like this. Last year, we also added our thoughts on Race Registration Market Trends and Race Registration Company Valuations. These are largely the same – and the trends in the data seem to confirm our thoughts. RunSignUp has been very public about sharing our numbers. You can read our Year End Report for 2015 to see that we had over 10,000 races use us to process 2.7 Million paid registrations in 2015. The trend continues positively – in February we added 949 races (averaging 32 per day) with payment accounts (meaning they were planning on doing registration with us and not just a race listing). This is in addition to 773 renewed races. The trend continues positively and we are estimating over 4.1 Million registrations in 2016. 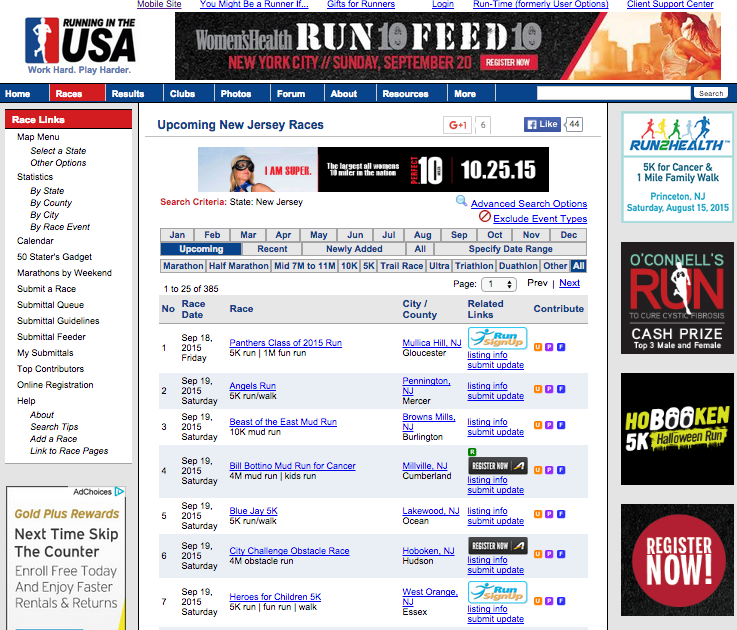 RunningintheUSA.com is the largest calendar of race sites in the US with 50,356 races listed. They use Active.com’s, RunSignUp’s, and Race Entry’s automated API to load races from each of us – that is why you see the little logos for each of us on the calendar. This probably means that we are unfairly represented as they do not get every race from every other of the 100+ registration providers in the market. One data point does not make a trend, but our overall impression of Active losing market share and RunSignUp gaining share are confirmed with Active down 2 points and RunSignUp up by 3 points. RunSignUp has had over 11,000 races over the past 12 months that we have processed registrations for, which is 22% of the races in RunningintheUSA, so those numbers are probably fairly accurate. There are over 100 registration systems, and not all of them have race listings. For example I could not find a list of Chronotrack Live races, but know from their public statements that they processed over 1 million registrations in the first half of last year. Likewise, IMAthlete is much stronger than this list shows because of a number of large events they provide registration for like the LA and Philadelphia Marathons. In addition, the search tools may include non-endurance race events in some cases. And search methods change from period to period – for example Active has a new search tool and it is not clear all of the events were endurance. This is not applicable for Spring, but we will keep it here for our next report. RunSignUp has 127 races on Nov. 26 and 86 of them have (Turkey) in their name. To put some context on these numbers, RunSignUp is doing about 2.5 Million Page Views per week now to get in the Top 5,000 sites. In September, we were doing 1.8 Million Page Views to rank about 7,500. As further context, another company Bob is on the board of has a page rank of 35,064 and has 265 Thousand visitors per week. Our objective in doing this was trying to understand how far we had gotten with our growth. We are guessing that we are at about 10% market share – assuming there are about 30-40 Million Registrations in the US. It looks like this will put us as one of the leading endurance-only focused registration provider in the US, and hopefully pass Active in the next year as the leading race registration provider. Was Friends the Downfall of Western Civilization?